(Photo: Ecumenical News / Peter Kenny)World Council of Churches general secretary, Rev. 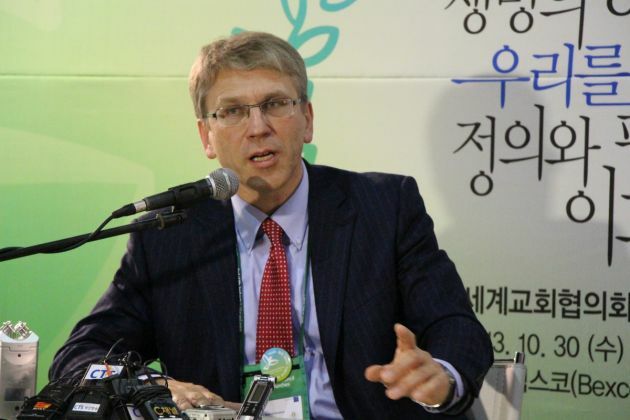 Olav Fykse Tveit, addresses journalists on November 7, 2013 during a media conference at the WCC 10th Assembly in Busan, South Korea. The World Council of Churches says it is deeply concerned that the standoff in Ukraine, into which Russian armed forces have entered, puts many innocent lives at risk. "The World Council of Churches is deeply concerned by the current dangerous developments in Ukraine," Rev. Olav Fykse Tveit, general secretary of the WCC said in a statement on Monday. Leaders of Ukraine's churches joined in a plea to Russian leaders to "abandon the military and other... interference in the internal affairs of Ukraine." Their pleas came during a rise in tensions inside Ukraine after Russian armed forces entered Crimea over the weekend. The Ukraine church leaders said that Russian military intervention especially is "a threat not only to our country but to the peace and security of the entire European continent." The statement was released by the All-Ukrainian Council of Churches and signed by its leader, Metropolitan Onufry of the Ukrainian Orthodox Church-Moscow patriarchate, a church that has many Russian speakers. Russian Orthodox Patriarch Kirill of Moscow, who has been viewed as being very close to President Vladimir Putin responded to Metropolitan Onufry's plea. He promised to "do everything possible to persuade those in power that they cannot allow destroying peaceful people in the Ukrainian land so dear to my heart." The Russian primate said that although the Moscow patriarchate would not take sides in a political dispute, the Orthodox Church would do everything possible to prevent military conflict. But he said noted, "None of those who live in Ukraine today should feel strangers in their own home, whatever language they may speak. "Any further polarization of society and growth of violence against civilians cannot be allowed. The whole population should have their rights and liberties guaranteed, including the right of participation in the making of fateful decisions." The day before in Geneva, Russia's Foreign Minister Sergei Lavrov, speaking at the United Nations Human Rights Council, strongly defended his country's deployment of troops to Crimea, saying his country aimed to protect Russians until the political situation in Ukraine became normalized. "Violence of ultra-nationalists threatens the lives and the regional interests of Russians and the Russian-speaking population," Lavrov told the U.N. meeting. "Instead of a government of unity they have created a government of victors." For his part, Tveit said "The situation puts many innocent lives in grave jeopardy. "And like a bitter wind from the Cold War, it risks further undermining the international community's capacity to act now or in the future on the many urgent issues that will require a collective and principled response," he said. "Out of concern for the lives and security of all people who are or might in the future be affected by the continuing failure to resolve this situation peacefully, I call urgently on all parties to refrain from violence, to commit to dialogue and diplomacy, and to avoid escalation by rash words or actions." The WCC leaders said the consequences of failing to do so would lead to even more human suffering in Ukraine, and leave a gaping rift in the social and political system of the region and internationally.